Claire was still feeling dodgy the following day so we went looking for a local remedy. The proprieter of the Corner Cafe, where we'd been a few times came good in her suggestion of ginger tea – seems to be a great cure for a upset tummy. 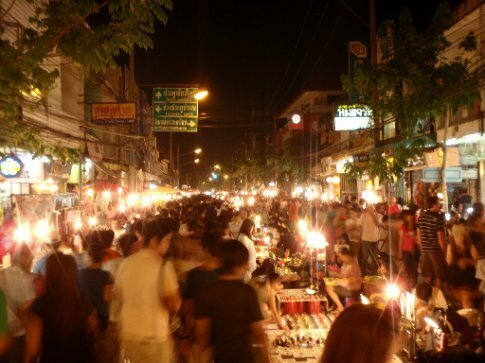 And so we were acquainted with the Chiang Mai Sunday market – a massive bazaar stretching along the whole of the Thanon Ratchadamnoen, the main street in the ancient city, from the Tha Pae gate to Wat Phra Singh and along most of the side streets too. The blind and disabled formed groups or perfomed along the middle with varying degrees of both professionalism and exoticism while the footpaths were filled with stalls selling everything from paper lanterns and Buddha imagery to deep fried cockroaches and thai fisherman pants. I suppose Chiang Mai, despite having 2 million inhabitants is a relatively small place – we seemed to bump into the vast majority of our cookery class as we made our way along the stalls. Another ginger tea for Claire and she was feeling well enough for a street massage. Not sure of the etiquette we gingerly stepped onto the footpath where lots of people were prostrate and getting a good seeing to by what seemed to be near magical contortionists. “Massaaaage?” went the voice of a smiley lady “120 baht 1 hour”. We settled for a half an hour - it was bliss for the back, neck shoulders and the head for a little bit. 30 minute massage for £1.20? We must be in Asia! On the way back we met another couple from the cooking school, 2 Scots, Ross and Carrie, living in Oz on their way back home to visit (they told us 2009 being the year to come home and visit i.e. stimulate the economy). They had been doing a massage course which sounded kinda fun, kinda interesting, kinda crazy. We arranged to meet up the following evening for a bite to eat. Having resisted the temptation to buy anything apart from the aforementioned street massage, a few lovely pork kebabs and a pair of hammer pants (think MC Hammer at his finest) Claire had been coveting for some time, we decided to call it quits and make our way back to North Star. We were in the mood for some down time the following day – planning as we were to go on the trek the day afterwards. Claire caught up on some reading and some sleep while I caught up on some internet. I got some great news as the taxman paid my reclaim of overpaid taxes for the year. The only thing was it didn't seem to be clear. I spent an hour or so on the phone to the bank and HMRC trying to sort it out but the advice was wait and see so i did just that. Later we had our briefing with Rey at Mr Pooh's Eco trekking office. There was that little bit of anticipation as we would find out who, if anyone would join us apart from the Japanese couple. It turned out that the wife of the japanese couple had ended up in hospital, quite badly ill and they would not be joining us. They had however very kindly left their deposits so that we could benefit from the group price. We would be joined instead by 2 girls, Kallie from Texas and Christine from Toronto. They seemed pleasant enough and we arranged our meet up point in the morning. Carrie and Ross met up with us afterwards at the Tha Pae gate and we wandered towards the night bazaar in search of some food. The night bazaar seemed to have much the same stuff as the sunday market except with a lot more pushiness and beer t-shirts. We found the touristy food court and had a very pleasant dinner, chatting about travel and travellers, living away from home and at home and curiously a lot on Protestantism and Catholicism. We bade them farewell – they would be off to Laos before we would get back from the trek and promised to stay in touch.